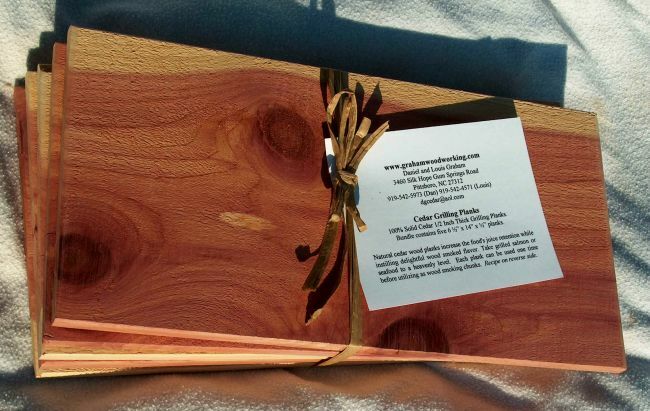 Our 100% solid cedar 1/2 inch thick Grilling Planks are all natural and untreated wood. Each bundle contains five 6 ½” x 14” x ½” planks. The aromatic quality of red cedar lends to a delightful spicy wood smoked flavor when used a grilling plank for fish or meats. Plank grilling also increases food’s juice retention. On a grill set to medium-high, the planks will smoke, char and result in a richly flavored and moist fish or meat. Create a dramatic presentation and serve your fish or meat straight to the plate on the plank. After the plank has been used, crumble it up and reuse the pieces as seasoned smoking chips in your smoker or charcoal grill. Store your planks in a drawer or closet -- they’ll add a nice scent to these areas before going to the grill! 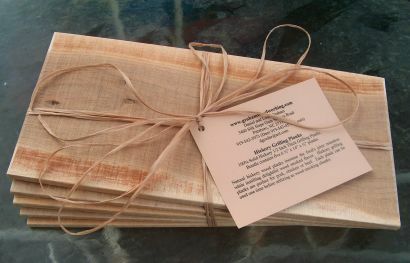 Cedar Grilling Planks: Set of 5 Cedar Grilling Planks. 6 ½” x 14” x ½” planks. $17.50 per bundle plus $8.50 packaging & shipping. If ordering more than 1 bundle of planks, shipping & handling is computed at an additional $3.00 per additional bundle, please email us your order and we will email you back an invoice with the discounted shipping. ($26.00 total for 1 bundle of 5 planks). 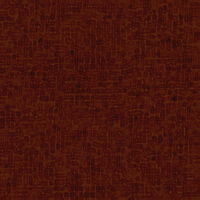 Hickory Grilling Planks: Set of 5 100% solid Hickory ½ inch thick Grilling Planks. 6 ½” x 14” x ½” planks. Natural hickory wood planks increase the food's juice retention while instilling delightful wood smoked flavor. 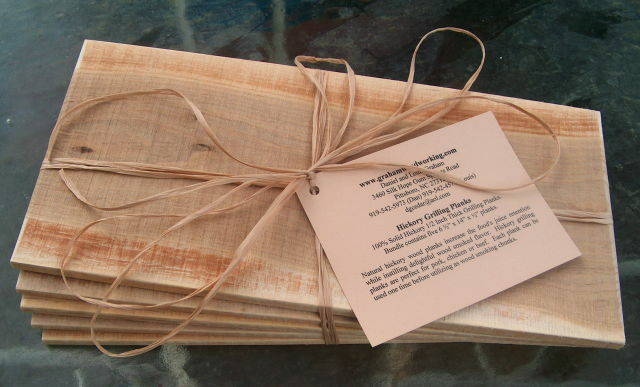 Hickory grilling planks are perfect for pork, chicken or beef. Each plank can be used one time before utilizing as wood smoking chunks. $17.50 per bundle plus $8.50 packaging & shipping. If ordering more than 1 bundle of planks, shipping & handling is computed at an additional $3.00 per additional bundle, please email us your order and we will email you back an invoice with the discounted shipping.. ($26.00 total for 1 bundle of 5 planks). Soak plank, fully submerged in water for at least 4 hours. Lightly sprinkle salmon fillet with salt and pepper. Mix juice of 1 lemon, 1 tablespoon olive oil and 1-2 cloves minced garlic in a shallow dish. Place fish (skin side up) in the dish. Place plank on a preheated grill at medium heat for 5 minutes. Lightly coat top of plank with vegetable oil. Place seasoned fish on plank (fish skin side down) and close grill lid. Maintain temperature at 350ºF for approximately 20-30 minutes or until fish is opaque and flakes in large chunks. Keep grill lid closed, check for flare-up occasionally. Douse any flare-up with squirt bottle filled with water. Lower grill temperature if excess flare-ups occur. After use, cedar plank can be used as wood smoking chunks.